Through West-Wide Climate Risk Assessments (WWCRAs) conducted under that program, Reclamation is conducting reconnaissance-level assessments of risks to water supplies and related resources in eight major Reclamation river basins in the Western United States. 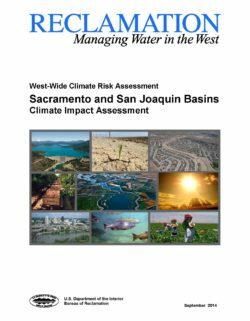 This report presents the results of the Sacramento and San Joaquin Climate Impact Assessment (SSJIA), which addresses impacts in two of these major basins in California. The SSJIA also includes the Tulare Lake Basin in the southern part of the Central Valley of California; part of the Trinity River watershed from which some water is diverted into the Central Valley; and a portion of California’s central coast region where Central Valley Project (CVP) and State Water Project (SWP) water supplies are delivered. 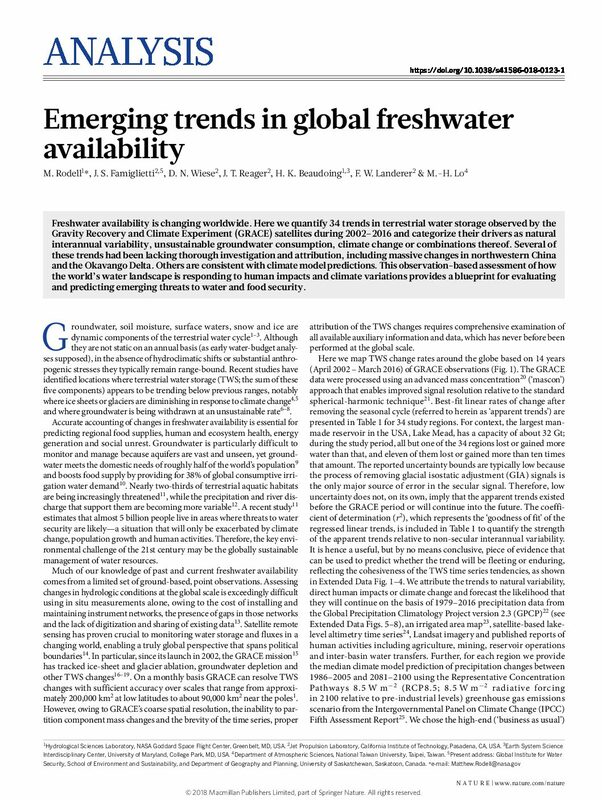 The water supplies and demands analyzed in the SSJIA include CVP water users, SWP water users, and the other non-project water users in the study area. Included in the report is an overview of the current climate and hydrology of California’s Central Valley (Sacramento, San Joaquin and Tulare Lake Basins), an analysis of observed trends in temperature and precipitation over historical record, and a comparison of these trends to future water operation projections not considering climate change. 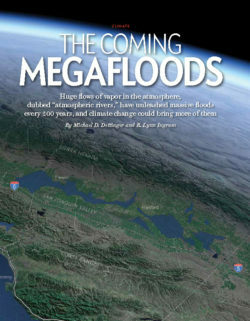 The report then presents hydrologic projections developed from global climate models to evaluate the ways that projected climatic and hydrologic changes could impact water availability and management and water demands within the Sacramento, San Joaquin and Tulare Lake basins. The SSJIA analyzes potential impacts of climate change under a current trends projection of future urban growth considering the conversion of agricultural to urban land use and assuming the continuation of current crop types in the Central Valley. Finally, the SSJIA assesses risks to the eight major resource categories identified in the SWA by looking at a range of climate futures and attempting to book-end future uncertainties. Over the past century, sea level has risen nearly eight inches along the California coast, and general circulation model scenarios suggest very substantial increases in sea level as a significant impact of climate change over the coming century. 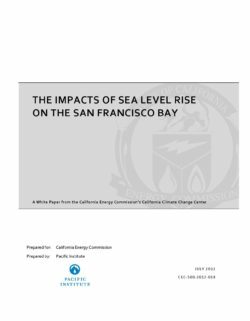 This study includes a detailed analysis of the current population, infrastructure, and property along the San Francisco Bay that are at risk from projected sea level rise if no actions are taken to protect the coast. 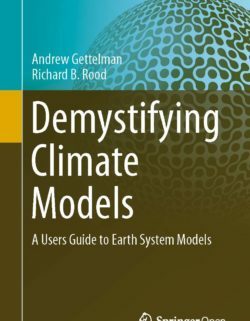 The sea level rise scenario was developed by the State of California from medium to high greenhouse gas emissions scenarios from the Intergovernmental Panel on Climate Change but does not reflect the worst?case sea level rise that could occur. If development continues in the areas at risk, all of these estimates will rise. No matter what policies are implemented in the future, sea level rise will inevitably change the character of the San Francisco Bay. We estimate that a 1.0 meter (m) sea level rise will put 220,000 people at risk of a 100?year flood event, given today’s population. With a 1.4 m increase in sea levels, the number of people at risk of a 100?year flood event would rise to 270,000. Among those affected are large numbers of low?income people and communities of color, which are especially vulnerable. Critical infrastructure, such as roads, hospitals, schools, emergency facilities, wastewater treatment plants, power plants, and more will be at increased risk of inundation, as will vast areas of wetlands and other natural ecosystems. In addition, the cost of replacing property at risk of coastal flooding with a 1.0 m rise in sea levels is $49 billion (in year 2000 dollars). A rise of 1.4 m would increase the replacement cost to $62 billion (in year 2000 dollars). Continued development in vulnerable areas will put additional areas at risk and raise protection costs. A number of structural and non?structural policies and actions, which are described qualitatively, could be implemented to reduce these risks.